There are many routes you can go down when designing your new bathroom, and one of the big questions will be whether you paint or tile. You may decide on a combination of the two, but many opt for full bathroom tiling. Tiles are versatile, practical, waterproof, easy to clean and suit any bathroom. Many people assume bathroom tiling must be cold underfoot but as tiles naturally retain heat, this generally isn’t the case. It’s often advised that the size of your tiles should depend on the size of your room, although there are no hard and fast rules. It’s generally suggested that very large tiles can dwarf a small bathroom; however if the tiles fit well, without too much cutting, the effect can be very striking. Similarly, very small tiles can look ‘untidy’ due to the volume of grout lines. When deciding what size tile to use in your bathroom, think about the size of the gaps between your sink, toilet and cabinets. Smaller tiles may look better due to needing less cuts. Many people opt for a versatile, medium-sized tile. The thing to remember is that this is your project – it should reflect your personality and you shouldn’t be afraid to make a bold statement, regardless of the size of your bathroom. Essentially, a small room will always be a small room, regardless of what colour or size tiles you use. Don’t compromise on what you want because you feel you should adhere to rules about creating an illusion of space. In a small room, it is almost always favourable to use lighter colours. Using white or cream in your bathroom will open it up and reflect the light, making the room appear bigger. However, darker bathroom tiling can have an incredibly striking effect, especially in larger rooms. You might want to consider tiling your bathroom floor with the same colour tiles as the walls, especially in smaller bathrooms, as this can create an ‘opening up’ effect. There are many styles of bathroom tiling available, not just plain colours! Some customers opt for stone or marble tiles, or ceramic tiles that mimic the effects of natural tiles. Bathroom tiling is a job best carried out by professionals; It’s not as simple as just sticking the tiles on and grouting in between. 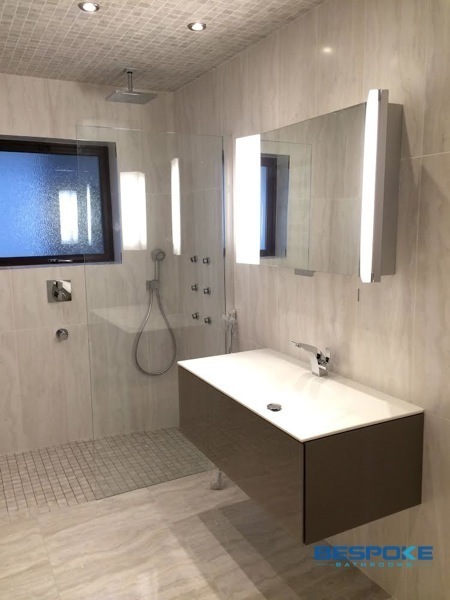 At Bespoke Bathrooms we will take care of your bathroom renovation from the very beginning to the very end, ensuring that every part of your project – including your bathroom tiling – is carried out to the very highest of professional standards.